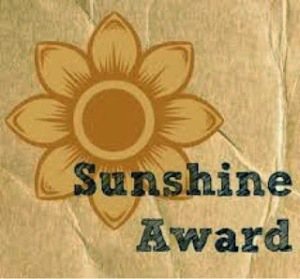 Sunshine Award? I wouldnt consider myself a ray of sunshine at times…. I was nominated by a fellow TTC’er who has become a great source of friendship and quirky humour. I will link her blog after I answer these questions that were forwarded to me by her. 1. Did you always want to be a mother? This is a very interesting question. Ever since I was little I grew up in a house of incoming and outgoing foster children. Our house was full of special needs babies and children. I was rocking babies and changing diapers from a young age. So yes, I always knew I wanted children of my own…..just never knew it would be so difficult to get to my goal. 2. At this moment, do your bra and underwear match? 3. Do I believe in soul mates? To be honest, no. I believe a certain person can make your life happier, give you more hope, and make you laugh but be your soul mate? No. I have the most wonderful man in my life….he makes me happy, makes me laugh and loves me, what more can I ask for? 4. What show is returning this month that you are excited to watch? Why? Sad to admit, but I like a bit of reality tv. It provides a bit of entertainment in my less that exciting life. I’m watching the Bachelor…well I’ve started to watch it but will likely get annoyed at the flakey women and turn it off. 5. Do you have a predetermined limit for when you longer will TTC? I’m guessing this means “no longer” TTC. As I am 36 in February, I feel that if this next 2 rounds of IVF do not work, then that will be our end of the “medicated help”. I may continue to try but not be involved with any sort of clinic. I will let the man upstairs decide if he is going to give us a miracle. 6. Name a personal quirk that drives your partner crazy. In his words….”the fact that she has like 20 pairs of hiking boots and running shoes” and can not part with any of them. I admit, I love my shoes. I walk for a living and I hike…and the tread on my shoes doesn’t last long but they are so worn in and comfy that I like to keep them…just in case;) Okay, so I’m a shoe hoarder. I can admit that fact. 7. If I friend you on Facebook, will you pretend not to have one? Too late, you stalked me and now here we are;) LOL. 8. Do you worry more about the appearance of your body or your face? I would have to say my body. I have always had a stalky build with tree trunk legs and a big booty. Its taken years to accept how and what it is. My face….well you can’t really change your face. You can add makeup but under all that “stuff” is the real you. I’ve earned my wrinkles, and my sun spots from daily life. 9. What do you most look forward to as a mother? First, I would like to look forward to being pregnant. I will take the sickness, the stretch marks and the midnight snacking. I want to be able to experience the kicking and movements in my belly. The thing I am most looking forward to is seeing the look in my little ones eyes when they realize I’m “mum” and they give me a big gummy grin. And of course..to have someone who will become a valid person in society because of how they were raised. 10. If fertility and money were of no consequence, how many kids would you have? In my perfect world, I wouldn’t be infertile and would of started motherhood when I was at least ten years younger than I am now. But saying that, I wasn’t in a stable enough and healthy enough relationship to bring children into. BUT, ideally…I’ve always wanted 4 boys. I grew up with two brothers who would beat me up and do brotherly things to me. I got charley horses, noogies, and shot with lawn darts. I’m not really a froo-froo girl and I’d rather go play in the forest rather than put on an image of girliness, with perfect hair and makeup. SO that’s why boys would work so well with me. But saying that, I just know I will get pregnant and it will be a girl. Bring on the frilly pants, ponytails and patience. Thank you Nina for the nomination. You make me smile. Please have a look at this ladies blog. She’s such an extraordinary person and will be an amazing mom one day. Its amazing that you can be in someones life as a source of support and become a friend. Welcome 2014, I’ve been waiting for you. I absolutely think you’re a ray of a sunshine! You’re supportive and positive but realistic and down to earth. I love your answers. I think you need to throw away some shoes. I know you will be an amazing mother! I enjoyed reading this 🙂 You will be such a great mom. You seem very grounded and have a good attitude on life.